One of the wonderful things about Mexico is you can purchase almost anything on the street. This little stand can be found 2 blocks from our house. She is there early every morning with containers of cut up fruit...and cucumbers. and right behind her you can see another stand that is there. She also sells brooms, wet and dry mops, and other household stuff. She is consistent, always at the same locations, selling the same thing. This is a mobile cart. 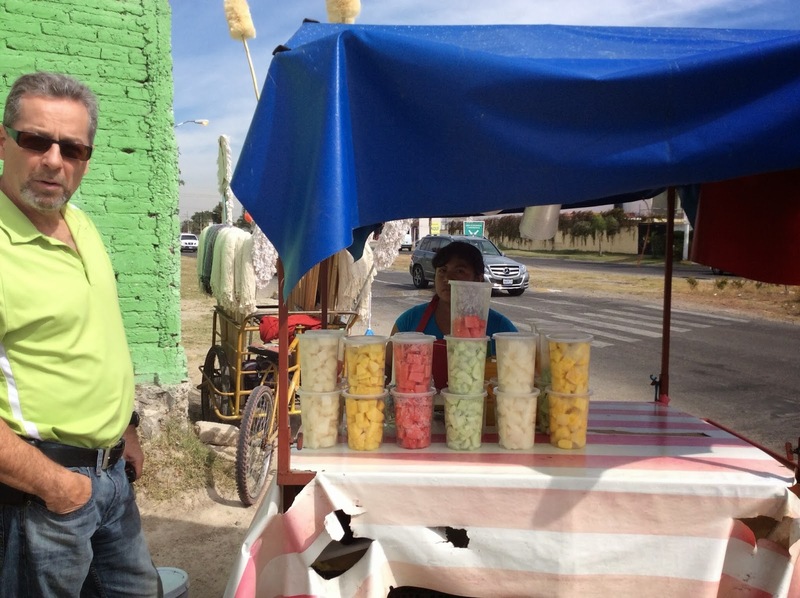 This guys sells "Tejuino" which is a local beverage made from corn. He told me it was cold, it was NOT fermented (which it was at times in Nicaragua), he added pineapple and 'piloncillo' which is sugar made from sugarcane. He also sells snacks, chips with salsa. He however, unlike the previous lady, is mobile and is not always found at the same place. Love the little mobile carts.